When you step into the Galleria Shopping Centre, you’ll be forgiven for not knowing what year it is. Built in 1972, the Galleria stands at a crossroads, suspended between what it used to be and what it’s about to become. When it was new, the curved ceilings in the hallways expressed futurist aspirations. 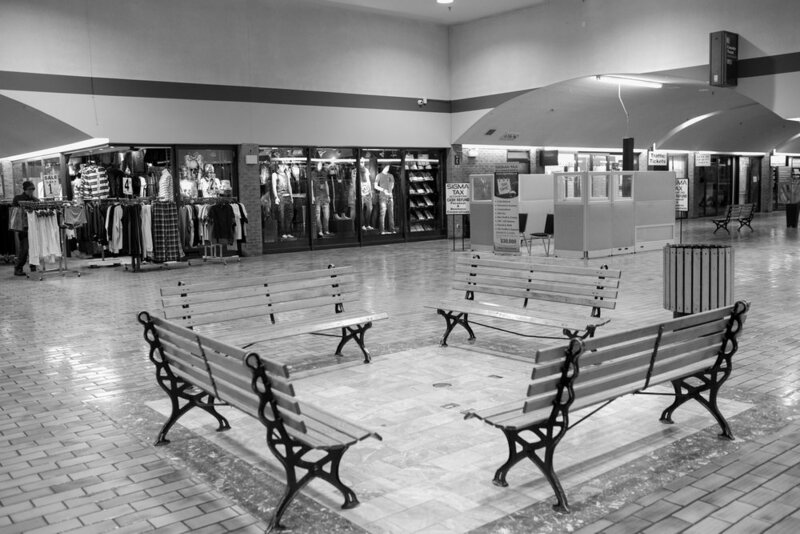 Forty-six years later, the future looks very different, but the mall sure doesn’t. 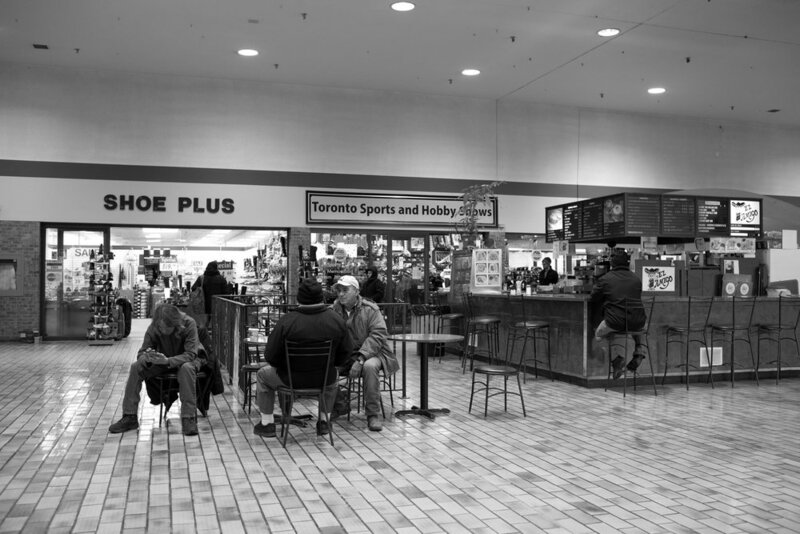 A living relic, unlike ancient ruins, the Galleria seems untouched by time. At the site of the legendary Troy, archaeologists have uncovered seven distinct layers of civilization. Modern-day Rome rests upon tunnels and catacombs from another age, and London has its own vast underground, some of which was built by ancient Rome. When a place has enough history, it becomes known as much for what it was as for what it is. Istanbul was Constantinople, after all. 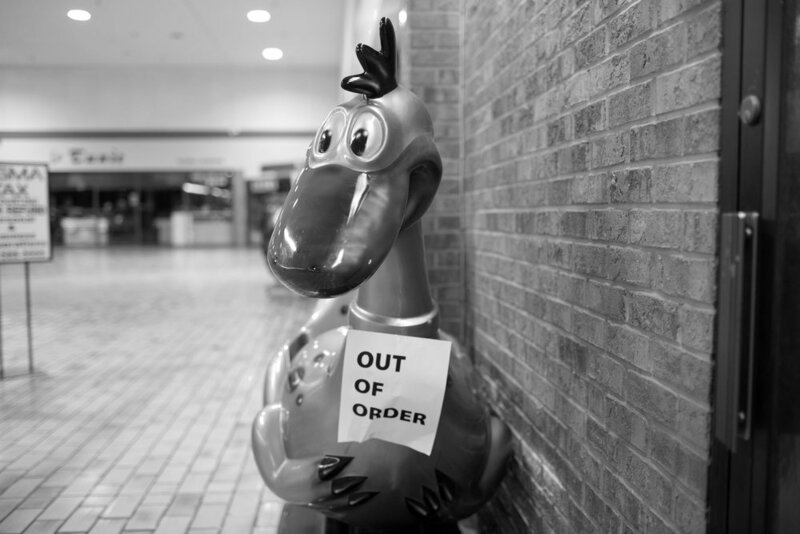 Cities build over their pasts, but malls just change their stores. There used to be a Zellers in the Galleria. Before that, it was a Towers department store. The FreshCo supermarket at the east entrance used to be a Price Chopper that, in turn, used to be a Food City. 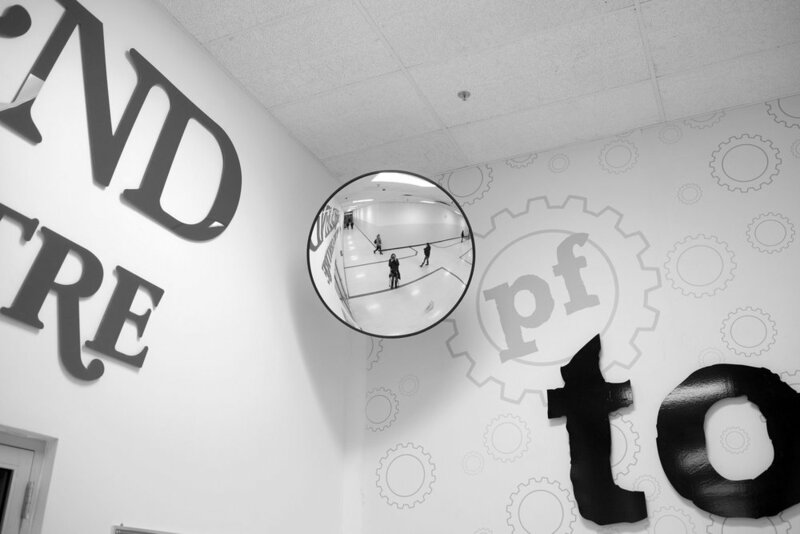 The terminus of one dim hallway is covered over with towering white hoarding emblazoned with outsized signage for a Fabricland store. Who even remembers what that hoarding is covering up? Shoppehenge. Ruins. Perhaps some cracks of the past are showing after all. There was a gas station in the northeast corner of the parking lot. It’s gone now, but there are remnants of fixtures and scars in the asphalt where it once stood. Inside, an empty display case bears large red letters that spell “Smoker’s Choice” – all that remains of a tobacconist, vanished in a puff of smoke. In the middle of the cavernous central hall, four benches are huddled impossibly close together, their backs to the compass points, facing inward. The only thing missing from this meeting place is a circle of rocks. Soon, it will all be gone. A proposed redevelopment will raze the shopping centre and replace it with eight residential towers. For now, the Galleria is caught in a time warp. The most modern artefact to be found there is also, quite appropriately, an anachronism. 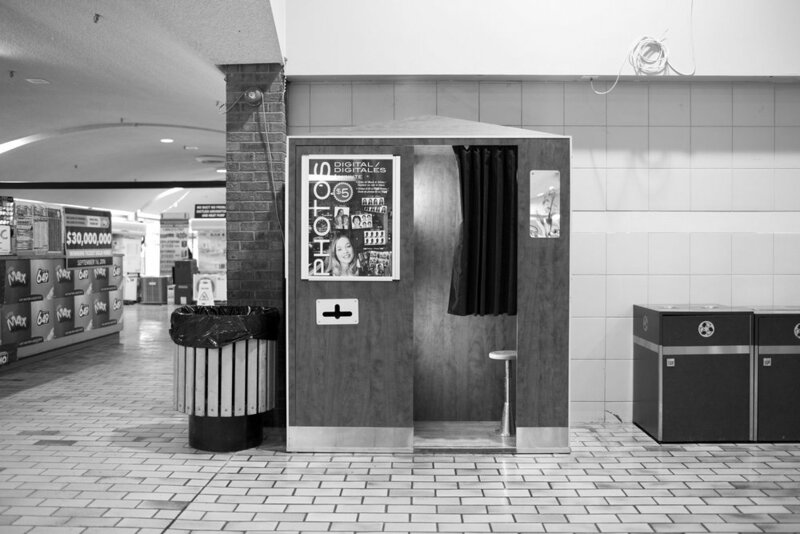 It’s a photo booth. This amusement from another era has been shoved to the side of the central hall, presumably the only place where it could be plugged in. Largely unused, it stands there like a Tardis displaced from space-time, inwardly gleaming, magic in its guts. I stepped inside and drew the small black curtain shut. It seemed larger on the inside than it did on the outside. When I was seated, a faint voice spoke to me from behind a computer screen, providing guidance. I fed a crisp five-dollar bill into the slot and smiled. Lights flashed. Seconds later, my fully developed photographs were dispensed from a chute on the side of the machine. To my surprise, when I stepped out of the booth, it was 2018. Even though the anticipation of visiting Fabricland is coursing through me like a river, I make myself linger. I pause before the candy and toy dispensers at the entrance of the mall, then at the inexplicable model of the Titanic, complete with tiny, ineffective lifeboats, in the display case at the kiosk where you can also send a Western Union transfer. In front of the trading card vending machine, I contemplate the packs of 1990–1991 NHL Pro-Sets, wondering if I ought to try my luck with a toonie in the hopes of finding Pavel Bure or Trevor Linden. But it’s as though the years are coming out of their plastic wrappers, and I feel like I’m hurrying behind my mom again. I can imagine her striding purposefully down the hall while my sister and I try to catch glimpses of the ponytailed gymnasts at TDot Tumblers. I hurry as though Mom’s already inside, flipping through the Butterick and McCall’s pattern books. She made matching dresses for my sister and me in ungirly colours like black and navy with white collars, animal costumes for Halloween and denim totebags with our best friends’ names cross-stitched on them for birthday gifts. By the time we were in high school, we’d stop into Fabricland on our own – my sister to make purses to sell or drapey, gothy skirts she never hemmed, and me to make another go-go dress out of glittery printed fabric. I was worried but the heavy lookbooks are still there, with tabs bent from use. A Portuguese-speaking woman flips disconsolately through them, and though I can’t understand her conversation with her husband, I can tell she’s not inspired by the asymmetrical hems and oversized sleeves that are trendy these days. Neither am I, but patterns are easy to customize. I have so many unfinished projects. A dress needing a new fringe, Ikea cushions needing covers. This is a huge location, and I see so many possibilities. How long have I gone with this nagging feeling of something left undone? It’s hard to tell the customers from the staff. Pairs of women stand together, solemn in negotiations. Long cutting tables are bookended with bins of remnants and discounted printed snowman fleece. “I drive all the way from Elora to this location,” an older woman says. I wait while a girl in head-to-toe Adidas gear pays, her matching boyfriend leaning against a table of reindeer plushies and Christmas table decor. An Adele song, from her heartbreak period, threads between the mop buckets set up under the leaky ceiling. “When will you have the new spring fabrics on display?” I ask the saleswoman in the T-shirt with an Alex Colville quote: Anxiety is the normality of our age. “As soon as we can clear away the winter fabrics,” she says. I’m eager for the chambrays and marbled chiffons, still in shipping boxes on the floor. I’m eager for another season. “It depends on how high the rent is. I haven’t been informed,” she answers. I’m about to say, “We’ll wait and see,” but realize that there are some changes you don’t wait for. Eating at El Amigo Refreshments is like waiting for a flight in a small Cuban airport, stranded as it is past the lotto kiosk and the “ductless wonder” AC display. It’s marooned in an acre of toffee-tiled floor in the Galleria as though cables for power, water and waste stretched only so far, the developers abandoning all hope for charm. I’ve sat at the counter and ordered a club sandwich with a bowl of soup. This place feels like a place on your way to another place, as though my Greyhound is waiting outside and I have 20 minutes. Photos of sandwiches on the menu board have lost their red, so the food all looks sunk at the bottom of an aquarium. The owner of the kiosk, Anna, who is working today, has been here almost 10 years. “How is your man?” she says to the customer beside me. “He’s gone to buy a jacket,” the customer replies. Just a bowl of Sweet’N Low separates me from this customer, still in her ribbed parka, eating a bun, her purse hanging from an elbow. People inside malls wear all of their outdoor clothes. There must be 40 different meals you can order, from avocado sushi to a chicken Caesar wrap. Only one side of the orange menu board is backlit, which suggests the other items are seasonal, like we’re at a skating rink or an outdoor swimming pool. The immense selection weighs heavy, like rummaging through a credenza stuffed with bulky objects. Yet the kiosk offers a reprieve from the grind of consumer life brimming around and receding past us, like the time-lapse footage in Koyaanisqatsi. I watch her make my club while she chats with another cluster of familiars. From the ceiling comes music I can’t decipher, but it sounds like Charley Pride covered by Kendrick Lamar. Men are lined up at the OLG counter for scratch ’n’ win cards. In a glass booth, polyester ties are laid out like fillets of blue salmon. I have, in the past, given my son a quarter to insert in one of the Northern Beaver machines for jawbreakers and plastic globes filled with riddle cubes. When you live in a city you look for safe public places where you can let a child drift. This is one. My club arrives on a fluted paper plate and the soup in a styrofoam bowl. The food resembles the photos, and I realize it is because they are bathed in the intense green and yellow light cast down from the vast Dollarama sign. But boy is it good, the sandwich fresh and the soup full of chunks of celery, corn, chopped tomato, red pepper, broccoli stems, onion. As my plastic spoon pulls up the tail-end of a green bean it reminds me of that moment when you scrape the cutting board of vegetable scraps into the compost, and realize the arrangement is lovelier than the salad you’ve created. “I make soup here every morning,” she says. Her sink on one side, a rice cooker on the other. The espresso maker faces me. In 30 minutes, she has walked a kilometre around the moat of El Amigo, serving a dozen customers, opening a box to refill the heated patty display. There are grandparents in hats and a mother with her daughter. The girl, in pink snow boots, is given precise change for a danish. The coins scatter on the floor and an old woman in a wheelchair deftly picks up a dime and returns it to the girl. Above the cash is a Team Italia poster. The Italians left this neighbourhood but the Portuguese – valuing the art of walking – stayed. The food is British-Italian-pan-Asian. And maybe I have it wrong. It’s not just a place on the way to another place at all, but an internal organ that pulses out the heartbeat of a neighbourhood. As I approach Planet Fitness – the Galleria’s 20,000-square-foot budget fitness centre – I am confronted with purple: a purple banner at the door, purple shirts on the employees, purple trim on the treadmills and bikes, purple pillars, purple fitness equipment. Even though the ceilings are high and we’re on ground level and the rows of machines are flooded in bright artificial light, the room feels like a home gym in somebody’s basement. I warm up on the mats (also purple), then walk over to the free-weights section. It’s full – and full of men – but there are a few women, too. I give them looks of solidarity as I use a dumbbell to do single-leg deadlifts in a corner. Being a lunk – a person who drops weights and grunts – is verboten at Planet Fitness, so an unusual silence hangs in the air. Any violation results in an alarm being pulled by employees. It doesn’t happen while I’m at the gym, but videos on the internet attest to its wailing siren. Around me, a woman reads Fifty Shades of Grey on the elliptical. There are men in muscle tees: camouflage and purple. A man in a grey sweatsuit and black denim jacket performs a few squats, and two women chat on upright bikes. There are all kinds of shades and sizes of people here – everyday people – trying to be healthy and doing their thing. Soon, the wrecking ball will come. I’m not sure where they’ll go. There are eight coin-fed amusements at the Galleria Mall: Super Mario and Yoshi, a two-seat speedboat, an Airfthansa Jumbo Comfort Lines Boeing 747. 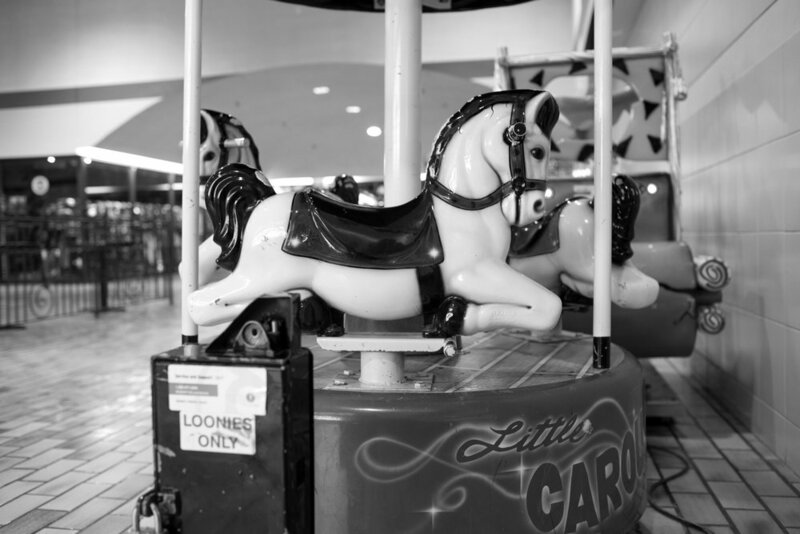 But the mini carousel, which seats three small equestrians, seems to have been separated from the others for a reason. Built in the ’70s by Miracle Recreation in Grinnell, Iowa, the merry-go-round runs longer than you’d think it would – a full dizzying minute – and spins through its rotations a lot faster than it probably should. Its musical program is the William Tell Overture, but the way it would sound if William Tell were blasting his way through Donkey Kong. My eldest child rolls his eyes in embarrassment while the younger one waves a chubby hand in the air, a maudlin “Ode on a Grecian Urn,” both joyful and excruciating. The view from the ride is always the same, in a rapid flicker: wooden benches (with men, or empty), antiseptic white-tiled wall, and flash-pops of orange light from the lunch booth’s menu board. Under the citric glow of the dollar-store sign, the ponies shouldn’t seem merry. But it’s hard not to love them better than anything else here – heads down, powder-coated manes rippling, legs tucked up and under in a hard gallop. They’re 45 years into it and clearly going nowhere, but at least they’re trying, with faces frozen in happy duty, no matter the burdens they are called on to carry. I’m going to call him my brother, because it’s what he calls me – “Hello, my brother” – in a quiet voice with a tar-thick tone. He says this as I’m rising from one of the wayward banquette chairs scattered across the guts of the mall in front of the open-faced salon whose existence is announced by two Lite-Brite words on a hanging LED window box: Nails. Open. My brother sits me in a levered chair in front of a tall oval mirror that reflects the mall’s southern LCBO entrance – a parade of mall-goers leaving and arriving; wonderful West End cinema – then Velcros a smock at my neck before drawing the largest of clippers and attacking my beard. Silver hair slivers the air. He works soundlessly, and quickly. My brother cuts hair as if it’s four minutes to closing with dinner waiting on the table at home. The largest set of clippers gives way to a smaller set for my head and a smaller one than that for my nose, ears and neck. Two men holding Tim Hortons cups fill the banquette gallery and one of them says something to my brother but my brother holds his hand up, then ducks below my chin before snapping the clippers at it; brow creased, eyes pinched, glasses knocked a little to the side. Through a snow squall of hair, I see a man in a greasy parka entering the mall, windmilling his arms at his sides. Then, hipster beardos arrive with iPhones drawn. Then, two tiny children walk behind a tiny mom who drags them on tiny shoes past a blinking NASCAR video game where, after my haircut and beard trim, I notice one of the beauticians from the other side of the salon sitting in the race car’s chair eating lunch from a Tupperware while checking her email. My brother draws the clippers back, puts a hand to the Velcro and says, “Okay?” but it’s never not okay. He tears the smock away like a magician revealing a reassembled confederate, which is, sort of, how I feel. I stand and move to the nearby counter, give him my debit card, pay him 11 bucks and thank him. “Cash is always better,” he tells me, turning back to the chair. I walked into the Galleria anxious I’d feel something I didn’t want to feel – something tied to the days when I lived next door with my now very ex-boyfriend. The Galleria had been a backdrop to the relationship’s rise and downfall. And while I couldn’t find anything that would take me back to 2009–2013 – the years we spent together – all it took was one glance at Collector Cards to take me back 20 years further. In the southwest corner of the mall, Collector Cards looked the same as most vending machines that sell chips and chocolate bars from dozens of little holders. You press a letter, you press a number, and then whatever you wanted drops down for you to pick up through the slot. Except instead of chips and chocolate bars, this one was filled with packets of hockey cards. I stared at the logos: Pro-Set, O-Pee-Chee, Score, Upper Deck, Fleer, Topps. I don’t know if I’ve ever watched a full hockey game, or even if I understand how the game works. But from my childhood into my teens, I collected the cards. Thousands of them. Every weekend, I’d walk to a little shop in downtown Trenton and spend my allowance buying them. It hadn’t all been a show. I really did grow to obsessively love my first ‘beard.’ I filled bookshelves with binders, all meticulously organized by the colour of the players’ jerseys, in the order of a rainbow. I knew the names of the players on all the cards. I knew their stats. How many assists they got in any given season. I bought a pack of Upper Deck, took it to a table in the courtyard and opened it. I laid out the cards on the table. I didn’t recognize the names of the players on the cards, and I definitely didn’t know how many assists they had in any given season. But I could still remember that feeling: the simple joy of expanding a collection, even if my role as collector had only started because I thought it would make people think I was doing exactly what boys were supposed to do. As always, there is a cluster of old men sitting on the benches in the central hall of the Galleria. I introduce myself. They stare at me blankly. I introduce myself again, in Portuguese. “Okay, well, you really look like a guy who doesn’t know anyone,” I joke back. He is sitting in the centre of the group and had been talking animatedly when I walked up to them. “This is my first time here. I live in Brampton. No, Mississauga,” he says, unconvincingly. Several of the men are wearing baseball caps. None of the hats say “Portugal” on them, but they may as well. The guy who claimed they were Germans is wearing a hat that reads Benfica, the most popular Portuguese league soccer team. The man beside him is wearing a LiUNA hat – that’s the construction labourers union – and a fourth sports a cap advertising the College Street restaurant Ilhas de Bruma. “Okay, fine, we aren’t Germans,” one says, but clearly that’s all I’m going to get. Another turns his back to me, and the rest get up to go outside “for a smoke.” I politely extricate myself. 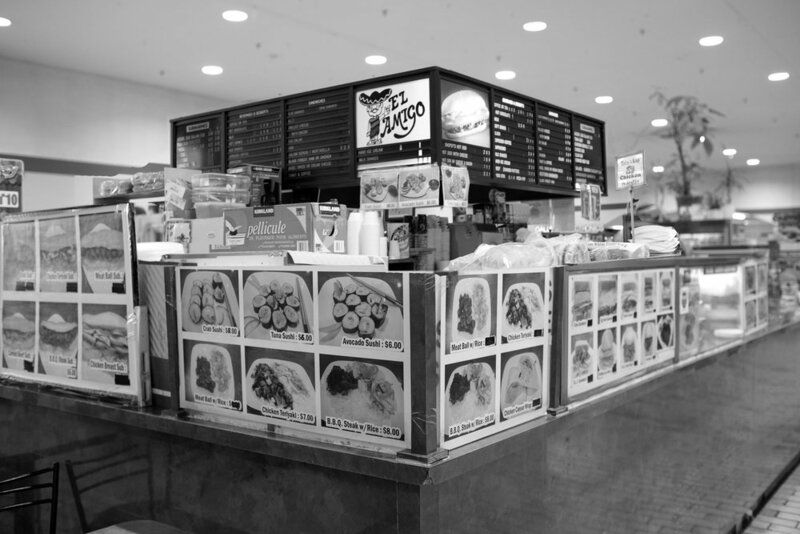 Zam Zam emigrated from Iraq to Toronto’s West End during the Iran–Iraq War in ’88. He’s upset that Italy and Ecuador are not in the World Cup this year because those teams’ merchandise normally sells well, though he also moves a surprising amount of Irish gear. Portuguese soccer gear is his top seller. When Portugal won the Euro cup, he had his cousin selling flags in the parking lot, discounted from $30 to $6.99. I stop in at another sports memorabilia store, Toronto Sports and Hobby Shop, which mostly sells European soccer jerseys. The woman at the counter tells me they are “very busy,” even though I’m the only one in there. She also says I’m not allowed to talk to people without clearing it with mall management and mall security. I make a hasty exit. I say that I think so, and I describe Forest Hill Village, which is near where he lives, asking if that’s what he means, and he says yes.